Lushof Lodge - Gariep and Dam Accommodation. 2,3km off the N1; 180km South of Bloemfontein; 55km North of Colesberg; 22km North of Gariep Dam and 30km South of Springfontein. We offer safe accommodation with plenty of open spaces where kids can enjoy themselves. Our farm is ideal for bird watching and long, peaceful walks in fresh farm air. Let your children enjoy farm life and during lambing season they can feed the hans lambs. We have 3 separate cottages from the main house. Our larger two cottages are situated on the side of our mountain behind the farm house and the smaller cottage is situated on our dam wall. All cottages: All linen and towels are provided. All meals are served in the privacy of your cottage. Dinner consists of Karoo lamb, vegetables, rice, roasted potatoes and desert. A cooked breakfast is served. Coffee, tea, juice and rusks for your use are in both cottages. 2 Bedrooms: 1 with a Double bed and the other with 2 Single beds. Open plan kitchen (fully-equipped) and lounge. Single bed as well as a sleeper couch in the lounge. Bathroom with a shower, toilet and wash basin. Heater and electric blankets during winter. Bathroom with a shower, bath, toilet and wash basin. Small fridge, a toaster and a kettle. Long distance soaring centre as well as a nature reserve, golf course, bowling green, fishing and sailing is just few kilometers away (Gariep Dam). 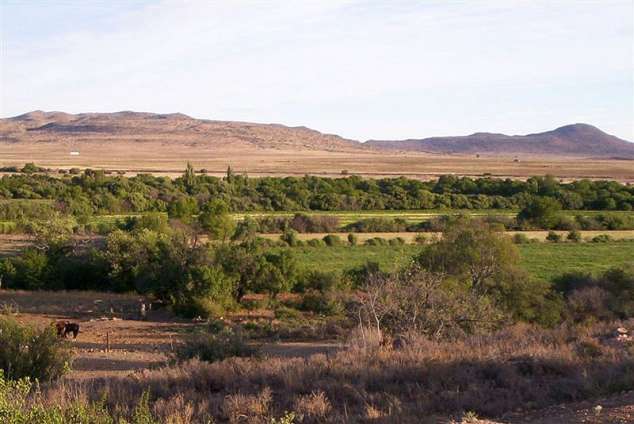 You will be greeted with warm and friendly Karoo hospitality and will enjoy a peaceful and quiet overnight stay. We are looking forward to welcoming you. Room facilities: TV (with SABC channels), ceiling fan, heater and electric blankets during winter months, housekeeping, braai facilities, hot beverages, fridge. On-site facilities: Secure parking, close to airport, wake-up calls can be arranged. Leisure close by: Nature reserve, caravan park, bowling green, golf course, fishing, sailing, Gariep Dam airport, hunting, Long distance soaring centre. You take the nr. 21 (Driekuil Ruigtevlei) turnoff off the N1. Road becomes a gravel road, cross the railway track and follow the "Lushof Lodge" boards. 26942 page views since 10 Sep, 2009.